My water broke at 4 AM on March 14, 2018. I woke my husband, checked in with our midwife and doula and decided I’d go back to sleep and wait for contractions to start. We headed to the hospital later that afternoon. The midwife performed a strip test to ensure it was my water that broke earlier and the test came back negative. I dilated to 5 centimeters fairly quickly, but my contractions had not picked up. Our midwife suggested we go on a walk to help labor progress, and return to the hospital later. As my discharge papers were being prepared, my water broke-AGAIN. This time the strip tested positive, and so, I was admitted. Our doula, Jeni, arrived shortly thereafter, we settled into our room and walked around the hospital in hopes that it would move my labor along. It was a few hours later and contractions still had not picked up. The midwife checked my cervix and to our surprise there was another bag of water (apparently there can be layers). This explained my water breaking several times that day! I decided the best move was to have the midwife break it again. Immediately following, I was in active labor. As the birthing tub was being filled, I tried out different positions, hoping to find some comfort, but Lilia was coming quickly and the pressure was intense. I walked to the bathroom, sat on the toilet, stood and leaned against the bed, kneeled on the floor and leaned into the birthing ball, and laid on my side, but none of these positions relieved the intense pressure I was feeling. 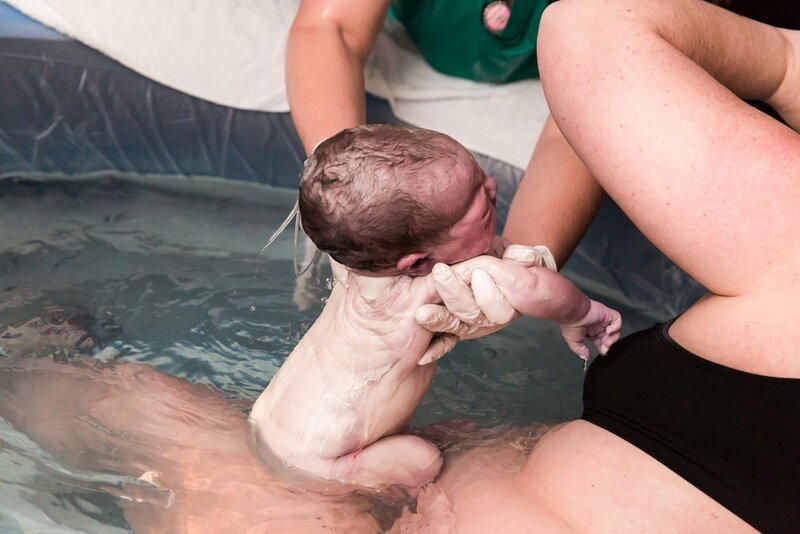 I felt immediate relief as I stepped into the birthing tub. The warm water soothed my body. I found a comfortable spot, and rested my head on the edge of the tub, and remained there until Lilia was born. I focused on my breath and worked through each contraction with my baby. I felt her moving quickly down my birth canal and told my husband that she would be here soon. Lilia was born quickly. My pushing was natural and not coached; I followed my body’s signals. The only words my midwife said were “your body was made for this.” That was a profound statement which helped me remain strong for the moments to come. I am so thankful for the midwifery model of care and that this particular midwife trusted that my body knew how to birth. She waited patiently until it was time to catch our daughter. Lilia’s birth was truly a beautiful experience. I had an amazing support team with my husband by my side and our doula supporting us both in the process. My midwife was calm, caring and patient, and for that I am forever grateful. I am so thankful for the support of midwives throughout both of my pregnancies and births, and for their trust that women’s bodies know how to birth. Happy National Midwifery Week 2018 to all of the amazing midwives out there!